Weird Fact about Chesapeake: We hosted a battle for 30 minutes and won. For Chesapeake, we are starting at the very beginning -- with the Battle of Great Bridge! On December 9, 1775, the British general Lord Dunmore was camped out in Norfolk, where he was fighting over available supplies that the local rebels were commandeering. 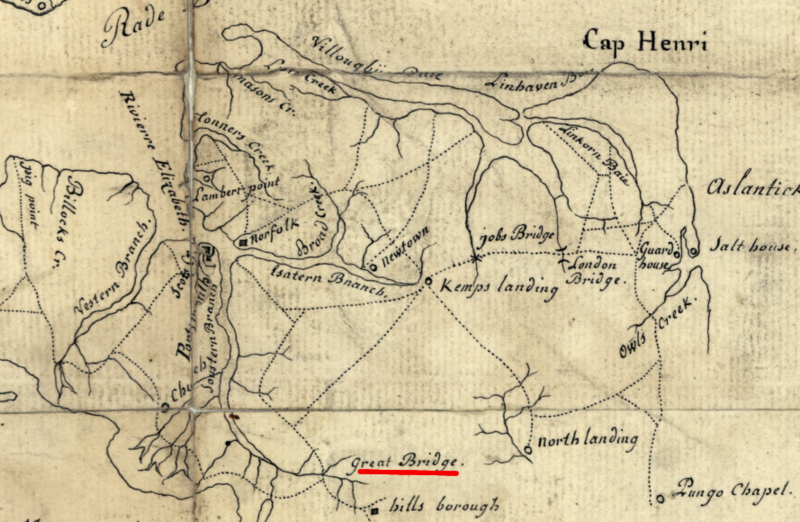 Dunmore's troops had control over one of the two bridges of the Great Bridge Waterways while Chesapeake had control of the other. The Great Bridge was fenced in by the Great Dismal Swamp, cutting Dunmore off from North Carolina. Chesapeake rebels and Dunmore's soldiers spent 11 days in a myriad of skirmishes trying to take each other out. When William Woodford showed up for the Virginia side with 500 soldiers, the British still outnumbered them by at least 300 men. So Woodford, who was originally hesitant about starting the fight, decided that the attack would take place in the early morning. The British soldiers had around 900 men and two working cannons, while the Chesapeake soldiers were sent cannons that didn't work. The Battle commenced at the crack of dawn, and Woodford caught Dunmore and his men with their metaphorical pants down. Dunmore chalked up the commotion caused by the battle as a small skirmish at first, underestimating the rebels. After it was already too late, the British soldiers rallied and marched against the rebels, but after 25 minutes of fighting, the British were forced to retreat to Norfolk, and Lord Dunmore himself hid onboard a ship. The British losses were officially recorded as 62, but a rebel prisoner of war who escaped British custody tallied the other side's losses at 102. The Chesapeake soldiers, on the other hand, had only one wounded soldier (suffering a wounded thumb) and lived to fight another day. Weird! But What Does It Mean? Later that winter, Dunmore burned down most of Norfolk, and that (along with the defeat in the Great Dismal Swamp) cost him any possible future foothold on Virginia. People always say time doesn't wait for anyone -- Who knew that in the same timeframe it would take us to watch a Friends episode, our Virginian ancestors would make quick work of their British foes? Here is a link to the Great Bridge Battlefield and Waterways Historical Foundation website. If you choose to visit the location of the battle site, you can take a guided tour, see the memorial to the fallen, and experience a museum (currently under construction, opening this spring)! Enjoy walking trails and a bridge built over the swamp by the local Eagle Scouts. Also, anyone can donate to help keep this Virginia landmark alive. Each December, an Annual Reenactment of the Battle of Great Bridge is held on the battlefield itself. 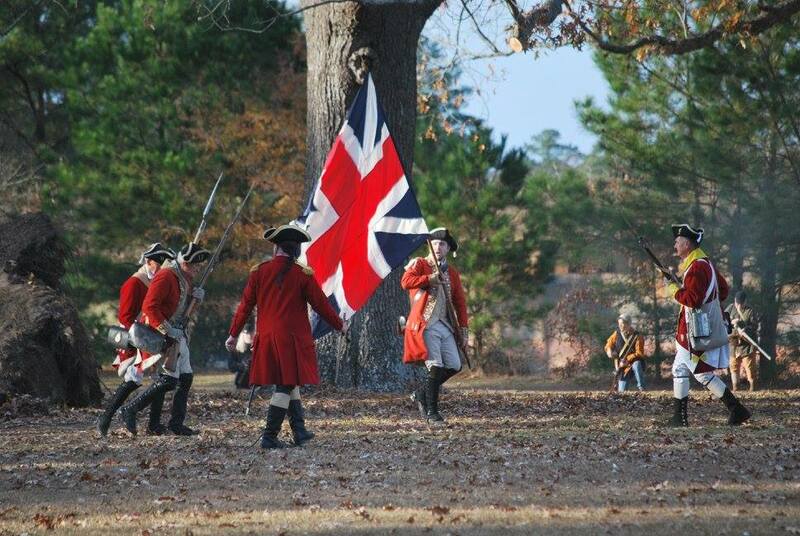 The reenactment is a two-day event, and it's free to the public. I attended one year, and it is an amazing experience! Have you been to this landmark? What other weird facts about "The 757" do you want us to explore? Tell us in the comments below! Check out our new Virginia Book Club -- featuring books and authors from Virginia!